This was the highest mileage week I have had in 2 months. I felt surprising good at the end of the week and had 2 strong workouts. Needless to say, I am very happy with how it went and hoping to see this hard work (and the ongoing training) pay off in May at The Eugene Marathon. Monday: Normally a day off, but not this time. I ran 45 minutes easy, home from work and then did a strength training session. Tuesday: I ran 60 minutes easy and then did an NTC core workout. Wednesday: (BIG) Group workout, 20 minutes easy, followed by 2 sets of 3km @slower than MP, 2km @MP, 1km @faster than MP, and 20 minutes easy. This was 12km of tempo and a total of 20km, not bad for a weekday workout! Thursday: 80 minutes easy, I also did a strength training session and an NTC core workout. Friday: 50 minutes easy, I ran home from work. Saturday: Group workout, 20 minutes easy, 5 x 4 minutes @3-5km pace, 20 minutes easy. Going into this, I wasn’t sure how my paces would be given how heavy my legs were feeling. I surprised myself and hit nice paces: 4:04, 4:09, 4:04, 4:08 and 3:55 for the last one (thanks for the push coach). Sunday: 80 minutes easy, pretty short for a long Sunday run. When I got home I did an NTC core workout. Solid week, solid week indeed. This week will be a bit lighter and I will be racing a 5km next Sunday as part of the Vancouver Island Race Series. The time to beat is 22:21, and I know I can do better than that! When I first started running, listening to music was non-negotiable. I could not imagine running without it and always had an IPod full of upbeat tracks to get me going. I have successfully ruined many songs this way, by playing them on repeat and not switching up my music enough. The upside is, anytime I hear Bruno Mars Locked Out of Heaven, I remember my trip to Rome and running on cobble stone everyday (and the pain in my legs that followed). Music has brought a lot of enjoyment to my running, but I am starting to question whether or not I should be listening to music on my runs. Music used to have a lot of control over my running and performance, I would delay runs if my IPod was low on battery. I have even attributed poor race performances to not having music (only once, or twice, but still). As someone who has spent most of their time as a runner, running alone, music was my company, my distraction when things got tough and my extra boost to cross that finish line. And then I ran the first 2 races of the year without music (it isn’t allowed for safety reasons) and still PB’d (WHAT?!). It seems I gave music too much credit. While music is not integral to strong performance (the pro’s aren’t wearing earbuds during competition clearly), I don’t think it’s a problem to use it as long as you don’t give it the weight I did. If you need music to get you out the door and do something active, by all means. I can definitely relate to that. If the music of choice is up tempo, I think it can help keep your cadence in check. The target is 180 steps per minute, so choose your music wisely! Presumably, you could use the music to train your legs to run at the ideal cadence and then continue to run efficiently without it. As of late, I am running with a group for both my weekly workouts and sometimes my Sunday long run. That leaves 3 or 4 runs a week to listen to music(Spotify’s Vacation Haus, anyone?). I will likely continue to race without music this season, at least for the Island Race Series, since it is not allowed. The big question is: do I want to run my next marathon with music or without? At this point, it feels like a long time to be running in silence and a lot of time to think. Racing a 10km without music is fine, but I am not sure I want to run 3 hours and change without it. That might change though. I think the problem some perceive with listening to music on the run, is that it distracts you from what you’re doing. It could cause you to be less mindful about your running form. Maybe your form falters and the thumping base drowns out your heavy feet, leading you to run like an elephant. Or maybe not. I can totally see the case for running without music for short distances. Realistically speaking, the reason for using music during a marathon IS for a bit of distraction because you’re running 42.2 frigging km and it’s going to hurt. Plus, my form will probably suffer during the last 10km of the race anyway, again just being realistic. I think I will make a decision closer to race day, since there are still almost 11 weeks between now and then. For now I will continue to use music for half the week only and see what happens. What are your thoughts on running with music? Have you ever run a marathon without it? Monday: OFF. I did strength training and an NTC core workout. Tuesday: 60 minutes easy, run home from work and a bit extra. I did an NTC workout too. Wednesday: Group workout, we did 20 mins warm-up, 15 mins @marathon pace, 5 mins @ 5 seconds slower than MP, 5 mins @ MP, 5 mins @ 5 seconds faster than MP, 10 minutes @ MP, 15 min cool-down. This was good and hard and it was quite dark, so at one point there were deer crossing in from of us which was a bit frightening in the dark. I did an NTC core workout also. Thursday: 75 minutes easy, this run was tough, but it taught me a very good lesson. I like to think I am pretty conscious of what I eat before running. However, I made the mistake of thinking a good sized bowl vegan tomato soup and with focaccia was an appropriate lunch to eat only 2 hours before my run. It was definitely delicious and I do love soup in the winter, but let me tell you, DO NOT MAKE THIS MISTAKE. Save the soup until after the run, otherwise you will basically experience the soup again on your run. Lesson learned. I did my second strength training session of the week too! Friday: 40 minutes easy, just a commute run home from work. This was quite challenging! 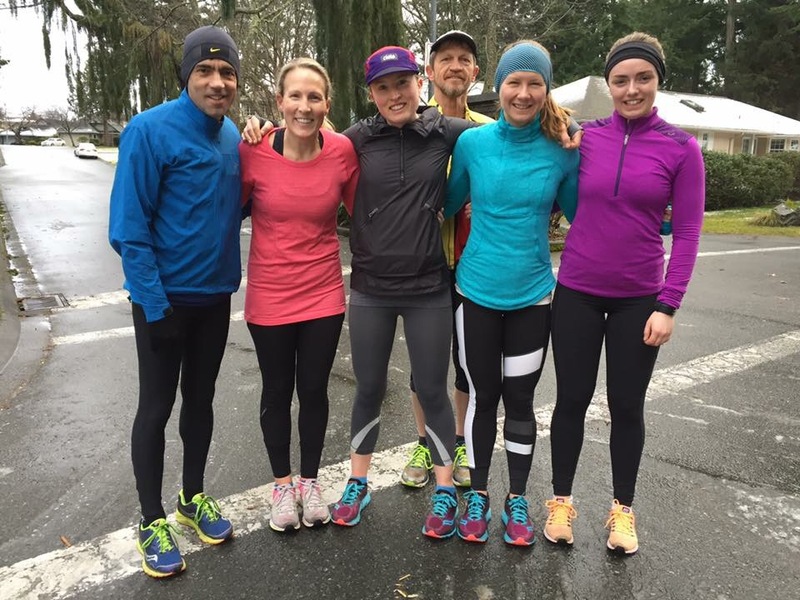 There was a larger group which split into 2 based on speed: the elites (varsity athletes at UVIC, Olympian and top masters) and then us (above average but not elite). To make it more fun we started guessing how long it would take the “elite” group to catch us, they actually never did, but we suspected they were walking back out on their breaks to be nice. Sunday: Long run, headed out nice and early to meet 3 other girls from the group. We ran along Dallas Rd and it was excellent. This week I’m going up to 95km, bring it on! In the world of Instagram, being an ambassador is like winning a gold medal. You advertise it in your bio, right under your name, sport and location and wear it with pride. It becomes a defining feature of your profile. In the last few years ambassador programs have become plentiful and accessible to athletes of all levels. The expectations for the ambassador vary depending on the company being represented. In general, you should be representing products you truly like and use and doing so in a way that creates interest from other viewers. This can be done in a variety of ways from wearing gear at races and events, to blogging about products, writing reviews, or just posting pictures and using brand specific hashtags on IG. The purpose is to promote the brand in (hopefully) a mutually beneficial relationship. The ambassador might receive product discounts, free product, a feature on the company website or social media pages etc. So how do you become an ambassador? There isn’t one answer. In my experience, many companies have application processes in the late fall/early winter. They often mention the application opening over their social media channels. The process includes a series of questions with topics ranging from what sport(s) you participate in, and how often, as well as your goals, what being an ambassador means to you and how you can partner to promote their brand. There is also a portion where you input which social media channels you use, how many followers you have etc. Sometimes they tell you when you can expect an answer back and you’ll either get a congratulatory email or one expressing regret, or no email at all meaning you were not chosen. This year I applied to be an ambassador for 4 companies whose products I already use. They all used the online application process I outlined above. I was very fortunate and was accepted as an ambassador for 3 amazing companies (2 of which are Canadian!). I am an ambassador for Nuun Hydration, Endurance Tap (gels), and Tiux (compression socks). These are 3 amazing companies and I am very excited to represent them! The other company I applied to represent was Saucony. I knew it was a long shot because the athletes they choose are typically in the elite category and I of course am not. I continue to use their products in training and racing and will continue to recommend their shoes to other runners because I 100% stand behind their products and brand. Tuesday: 40 minutes easy, I ran to work in the snow. It was pretty fun! Wednesday: The snowstorm: we did 115′ minutes easy due to our workout being cancelled. Thursday: 45 minutes easy, slush city, but it cleared up by the time I went running and the sun came out too. Friday: 30 minutes easy and 5 x 10” hill sprints, I ran home from work and since I live at the top of a hill either way, I used that for my hill sprints. Saturday: Group workout, 20 minutes easy, 10 minutes at marathon pace, 6-5-4-3-2-1 starting at half marathon pace and increasing speed, 6 minutes at marathon pace and then 20 minutes easy. This was good work and my legs felt it too. Sunday: You know those days where you start your run and are surprised by how fresh your legs feel? That was how this run felt, I was naturally going a bit faster than I would for a Sunday run, the sun was shinning and it was all just great. If every long run can be like this, the training cycle will be AMAZING! I also did 2 NTC workouts and a 1 strength training session, still working on doing 2 of those per week! The West Coast is not known for its winter weather. A large draw to living here is being able to comfortably run outside year round. Recently, the weather has been unpredictable and much more winter-y than we are accustomed to. It is cold, it is slippery and there is snow on the ground, not the usual conditions around here. I mentioned in a post earlier this week that this winter weather already caused 2 races to be cancelled last weekend! We are not prepared for snow at all. 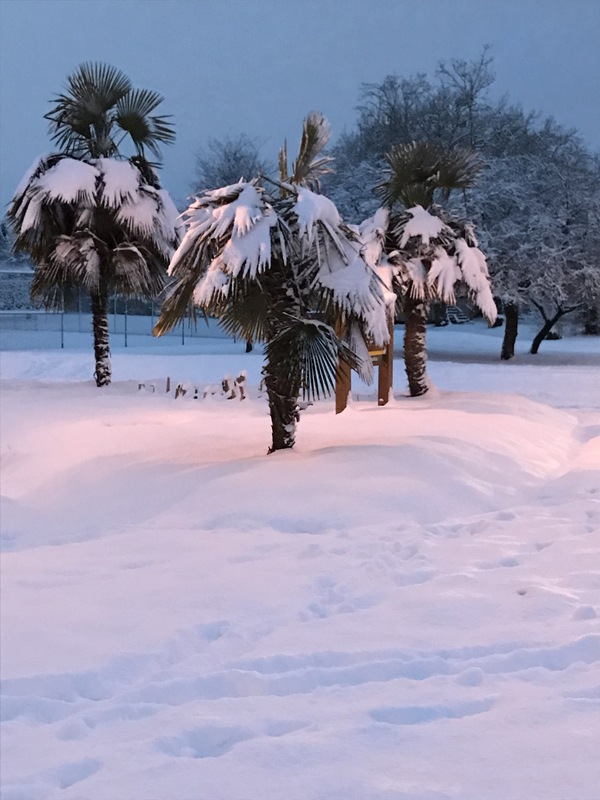 It caused the city to pretty much shut down last night, cars were abandoned on the side of the road, businesses were closed, buses were stuck midway up hills, it was chaos over a few cm of snow. Inspite of these obstacles, I still managed to leave work early and get my Wednesday run in. Wednesdays are normally group workout nights, but due to the poor weather and condition of the roads, it was cancelled. 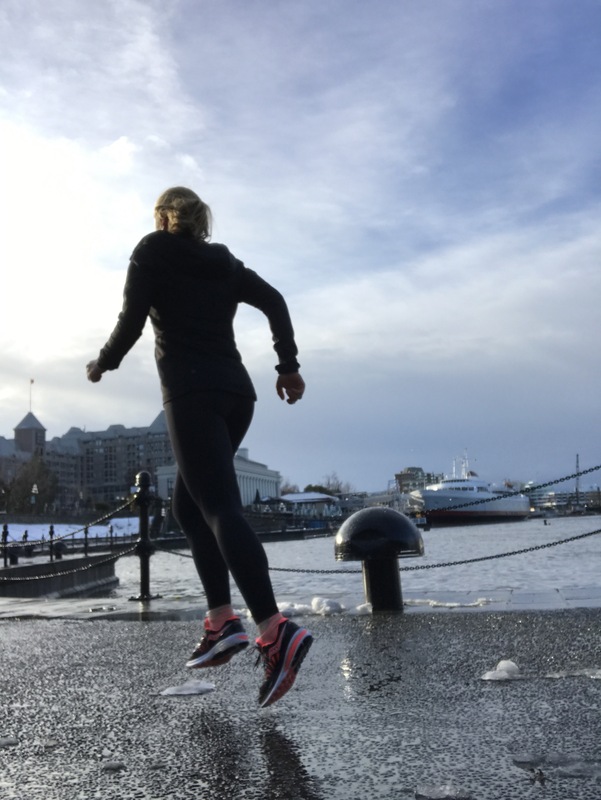 I am not one to miss a run and fortunately neither are my training partners, so here are my tips for training in inclement weather. 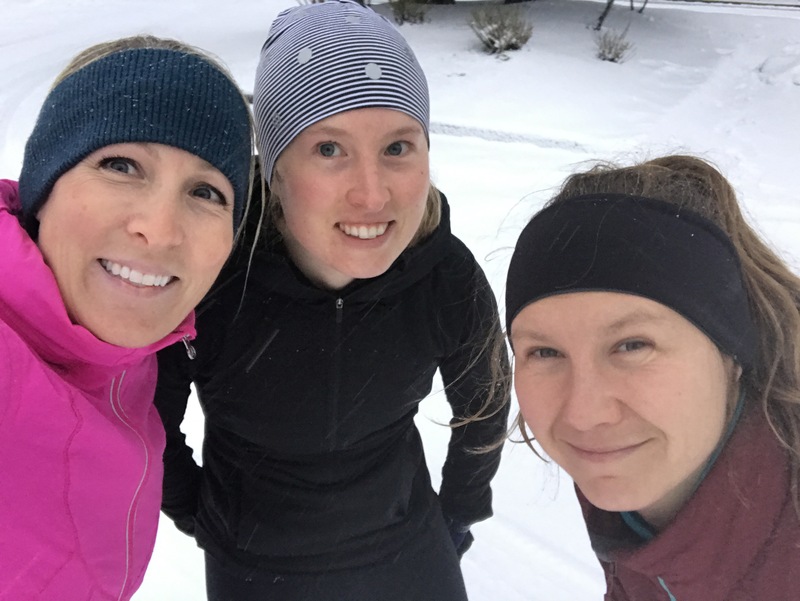 1) Find a crew as crazy as you: I mean crazy in a good way, because when we went out running Wednesday night in snow up to our calves, there was no one else running. It would not have been anywhere near as enjoyable to have gone out for 75 minutes solo in that white-out! 2) Dress well: There is definitely a sweet spot with finding the right number of layers. I always take one layer off before I head out and I have never been too cold on a run. I really wanted to keep my extra coat on over my run for cold pullover, but I decided to take it off. I would have been way overheated had I kept the extra coat! 3) Don’t stress over the pace: You can’t expect to run your regular pace in snow up to your calves. Even if there isn’t deep snow, ice is hazardous and even more difficult to run on. So slow it down, sit back and enjoy it, you’re still running! 4) Stop and take pictures: It doesn’t normally snow like this here, so naturally you want to document it when it does. Snow makes a great background for running pictures, which we definitely proved last night. Admittedly there were a couple photo breaks, though I also did some “wildlife photographer shots” meaning I chase my teammates and do my best to take non-blurry action shots. 5) Take in the beauty: After not having winter for 3 years since moving out here, I forgot how beautiful snow covered trees and scenery are. We were running on a trail that starts in a residential area and the lights were partially dimmed creating what one of my training partners referred to as “narnia like”. It definitely felt magical to be out there. The majority of our snow has already been washed away by rain or turned into sludge making for ice cold feet. It was fun for a day though! 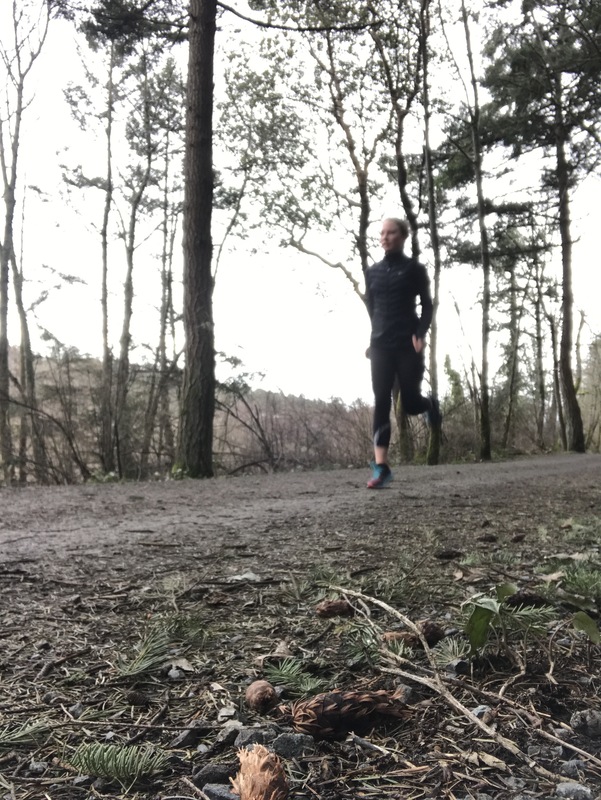 This week was mean to be a taper leading up to the First Half Marathon, first I’ll tell you what my training looked like and then I’ll talk about why I didn’t race! Tuesday: 45 minutes “easy”, a run home from work and beginning of the (unnecessary) taper. Wednesday: Group workout, 20 minutes easy, and then hill sprints: 2 x 3 minutes, 2 x 90 seconds, and 3 x 1 minute, and 20 minutes easy. It was freaking cold, so knowing I had a group to do this with was about the only thing that got me out the door! Thursday: 40 minutes “easy”, another run home from work. Friday: OFF (I only get more than 1 day off if I’m tapering or recovering). Saturday: Would have been 30 minutes easy, but due to the race cancellation I got to do a marathon training workout which was… 20 minutes easy, 4km @4:48 (slower than MP), 3km @ 4:41 (MP), 2km @ 4:34 (faster than MP), 1km @ 4:10 (10km pace), and 20 minutes easy. Those aren’t technically my marathon and 10km paces, BUT, you have to train hard to improve right?! I knew this workout was going to be hard work, but I didn’t anticipate how much my legs would “feel it”. Sunday: Would have been “race day”, I was actually happy to have done Saturday’s group workout in lieu of the race, but I actually had a back-up race for today. Since I registered for the entire Vancouver Island Race Series, there was also the Sooke 10km scheduled for today. I wouldn’t have been able to do it very fast after the Saturday workout. As luck would have it, on Saturday afternoon, I got an email saying that race was also cancelled due to poor weather! So, I had 105 minutes “easy” instead. I also did 3 NTC core workouts, no weight training this week due to the taper. There was supposed to be a race recap included in today’s discussion of my training from last week. As I mentioned, I was tapering for a half-marathon which I was meant to run yesterday. The plan was to go to Vancouver on Saturday, spend the night in a hotel near the start line and enjoy the race and being back in my old home. The mid-week weather predicted it would be cold on Sunday, “no problem”, I thought, “I’ve run in at least -20”. By the end of the week, things were not looking good, the weather called for snow, and a lot of it. Again, I thought, “well I’ve had more snow before and still gone running, so what”. By Friday night, I had no idea what was happening or if we were even going to go. We decided to stick with the plan and head over the next day. 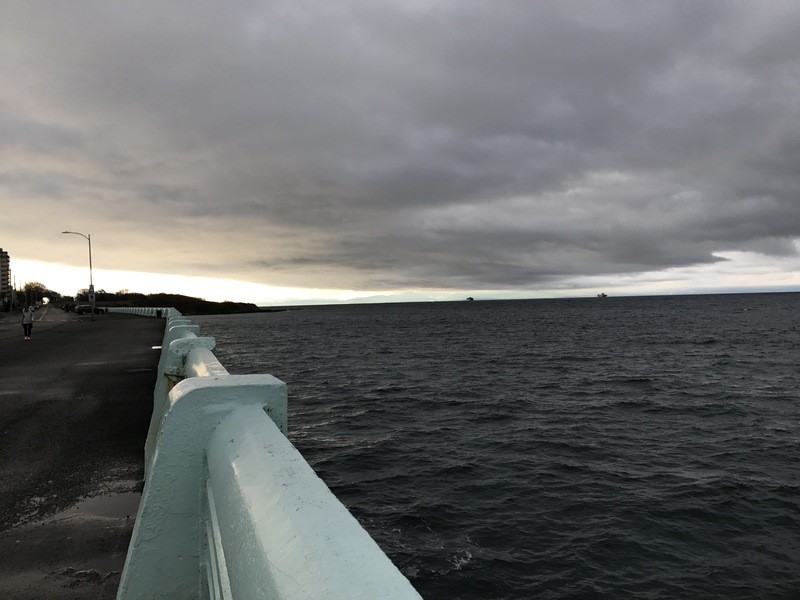 Shortly after, we saw from the race website that the event would either be re-routed and 2 miles short, so, an 18km race instead of a half-marathon OR it would cancelled altogether. The final decision was to be made at 3pm on Saturday. At that point we decided we weren’t going. Instead I did a marathon training workout with the other ladies in our group. It was a good choice because at 8am the next day it was announced that the race was cancelled for the first time in 28 years since it began. I can only imagine the frustration and disappointment of those who trained specifically for this race. Obviously the weather cannot be controlled and even if the race had gone on, the reality is, the conditions would not have been ideal. But still, they would have gotten their race. I know the training is supposed to be just as important as the actual goal race, but it’s got to be mentally tough to work hard for something that doesn’t happen. This was not intended as a key race for me, this race has begun allowing bib transfers (which I think all races should offer) and I accepted a bib from another runner who had conflicting plans. Have you ever trained for a race that was cancelled?